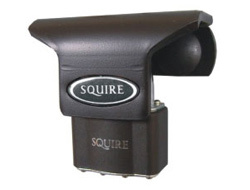 This is a really nice product in that it protects the padlock it is locked with. The unit is fit like any other hasp and staple with coach bolts through the door. Two opposing loops are then aligned when the door is shut, allowing you to put a padlock through. The holes are 14.5mm wide and therefore will be suitable even for the largest CEN Graded Granit Plus locks with 14mm shackles. It is generally design for open shackle locks but will work equally well for larger closed shackle locks, making it even more secure! The brackets and cover are 6mm thick which may not seem like much but they are made from hardened steel and considering you'd need to get through the cover and then with the brackets or padlock, it is a very secure option. 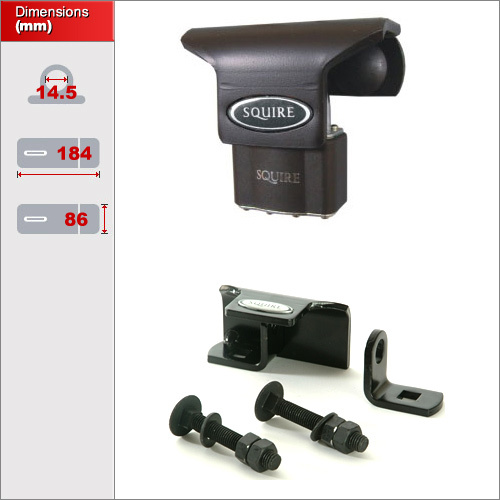 Since the padlock guard section is attached to one of the brackets, this unit comes in two versions. One which works with doors that open on the left side first and one for doors that open on the right. It is important you get the correct type. If you're door opens equally then it does not matter which type you get. Fitting is pretty straight forward. Two bolts secure the unit so you will need to press drill these. The diagram below will give you an idea of what is involved.